As soon as October rolls around I know its time to update my son's wardrobe for the Fall. Without going in the closet to see if any of his clothing fits I know it does not. He was my baby still last year and this year he is a big running talking toddler! His pants are all too short and his shirts his belly stick out of them. Clothing to me has an emotional attachment. Each time I put away a season and size of clothing I know he will not wear them again, makes me sad but happy knowing another baby one day will wear them. That is why I like to buy quality name brand clothing that I can save for future kids. 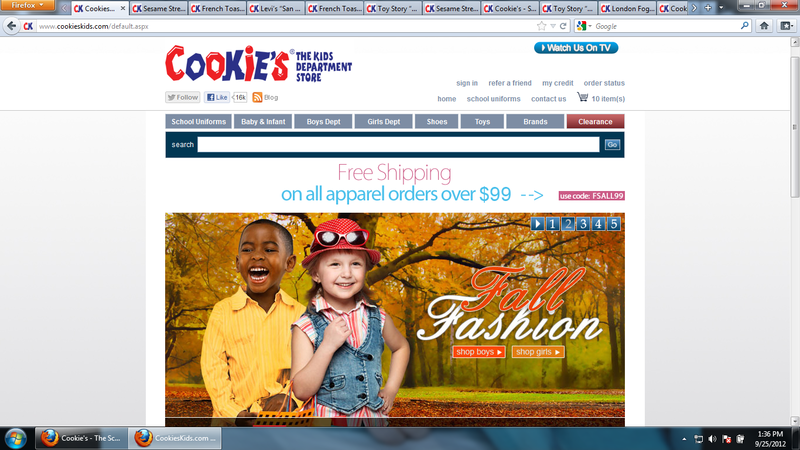 Cookie's Kids offers quality clothing for affordable prices, I can shop brand and low price! I always find something I love at their online store. My son is almost 3 so he does have a bit of an opinion on what he likes. I showed him a few character outfits and his favorite was Elmo. I would have picked Cars but he wanted Elmo, glad I asked him! Since he has changed sizes and I now buy him a 3T. I wondered if he needed a 3T in everything or somethings bigger or smaller. I was glad to see Cookie's Kids has the ALVA Kids icon to help you find the right size in a specific brand. 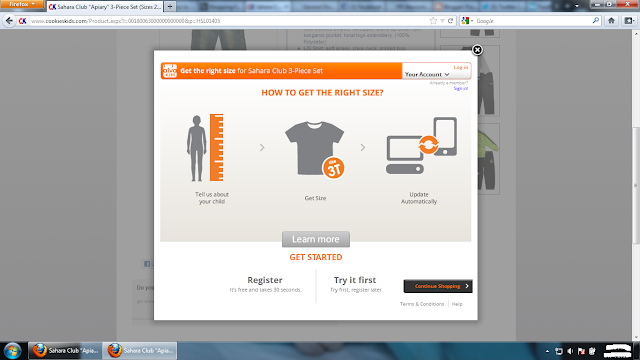 The application asked me info about my son's height to help determine what size he needed for the item, very helpful for online shopping. You can also shop in stores at Cookies Kids if you live near the 7 locations around New York City including the Bronx, Brooklyn and Jamaica. I was very happy with my purchase. I found everything I needed for under $30! Plus I found a few hoodies and a coat I want to get for my son asap. I love that about the site, there is everything you need and more! I like shopping online since I can email links to family for gift ideas since my son's birthday is next month. Makes it easy for them to know what he needs. My son loved this Elmo outfit. He picked it out himself. I paid only $11.99 for an Elmo Hoodie and Jeans set. A great deal since I can pair the jeans with other items and the hoodie I know he will wear often. I love this little outfit "Double Windsor" 50 Fifty. I only paid $10.99! I like button ups with a collar for getting pictures taken. We will be headed to a photo studio later this week and of course his best friend Giraffe will be there too. I was thrilled to see many items in the $0.99 Clearance sale. I found just what I needed in my son's size for tumbling class. I found a pair of U.S. Polo shorts and a French Toast tank top each for $0.99. I saw a few items I should have purchased at the time for next year Summer clothing but were gone when I looked again. So hurry and get those on sale items before they are gone. To get you started on updating your own kids Fall clothing Cookie's Kids has given me a coupon code to share with my readers. Awesome!! You can see all the great items I found online at Cookie's Kids to get ideas for updating your kids Fall Wardrobe by reading my Google+ story. Thank you very much for your great review! Please let us know if you have any suggestions on how we can improve AlvaKids.